← Did I miss the thumb drives in the FBI report? A couple years ago, Gladius recommended that I start a Twitter account. Well, I set one up under my libertybelle name and I’m libertybelle@october601 on Twitter. I thought Twitter was stupid and a waste of time, so after a few dozen tweets, I hadn’t bothered with it, but in the past week, I decided to start posting some tweets and commenting. Yes, yes, so lame, but I am going to paste a few of my comments here. I apologize for the really bad photos, but being technologically-challenged, I tried to do the screenshot thing on my PC, but couldn’t figure out how to crop photos or upload them to my blog. So, I snapped photos of my PC screen and uploaded them from my phone to my blog. Whatever, these are just meant to be a blog record…. of sorts. September 7, 2016: Posted a comment on a tweet by Jason Chaffetz and I also sent an email comment to Sharyl Attkisson about trying to find out who all was present for Hillary’s FBI interview. 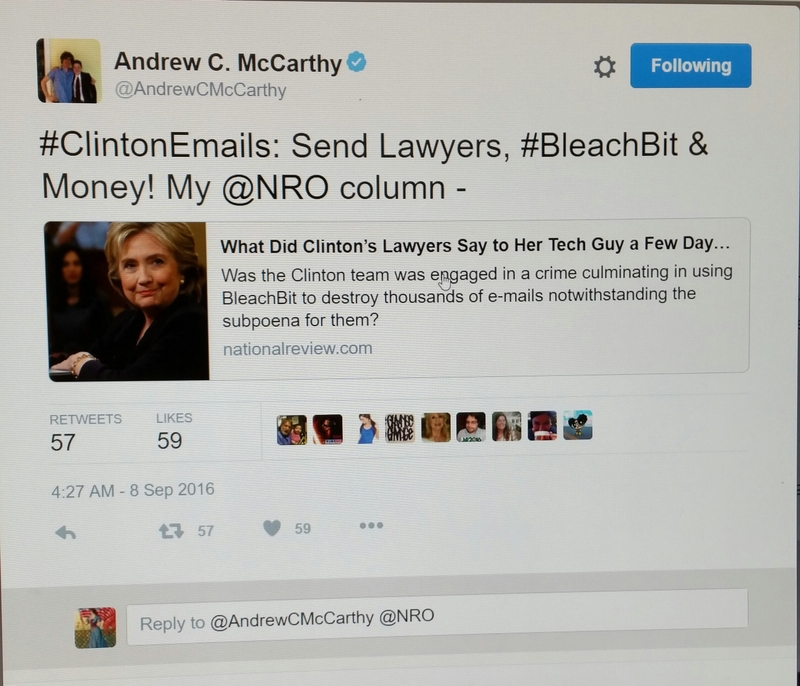 September 8, 2016: Posted comments on tweets by Andrew McCarthy, Jason Chaffetz and Trey Gowdy. Busy comment day for me, but I’ve got a ways to go to catch up to Donald Trump…. September 10, 2016: I emailed some information to Trey Gowdy, that I didn’t want to post on my blog. I posted a comment on his tweet, hoping that someone in his office might see my comment and look for my email. I did provide my real name and address on this email.